Companion Maids gets Super Service Award! 24 Apr Companion Maids gets Super Service Award! After another exciting year with Angie’s List, Companion Maids has received the Super Service award for the second year in a row! Since this is only our second year on Angie’s List, this is a heck of an accomplishment for us. The Angie’s List service award is only awarded to the Top 5% of companies in a given market, and with over 1,200 cleaning companies in Chicago, it was quite an honor to receive recognition in such a competitive area! What we like the most is that only reviews from paid members are displayed as a part of your overall rating. 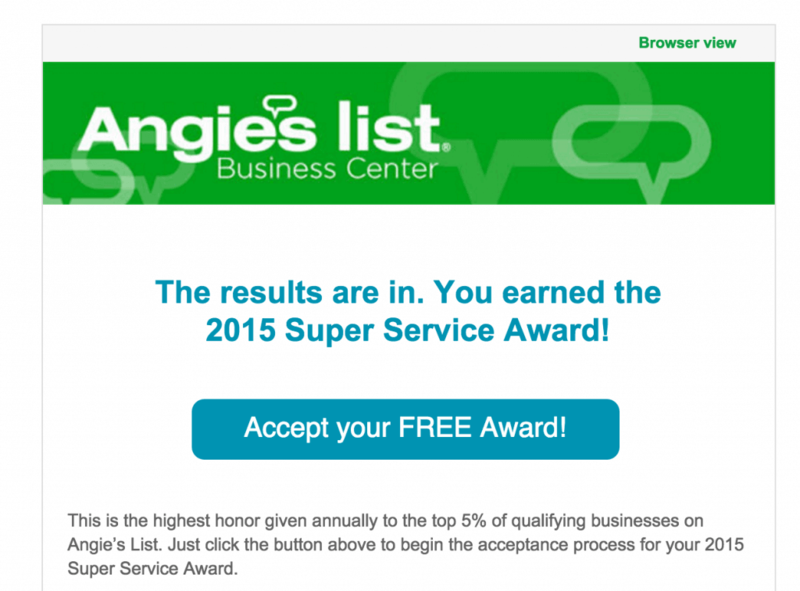 The rating algorithm for Angie’s List isn’t weird and hidden, as is the case for Yelp! So when we have a client that enjoys our work enough to post about it (good or bad!) as long as they are a legitimate AL member, we don’t have to sit around wondering if the review will post or not. I think this business model is a good one, as the fakes and phonies of the world usually aren’t ambitious enough to actually pay to post anything. In addition to all of the good we have experienced with Angie’s List, we had a few challenges. We dealt with two different disputes this year, as a result of a few things. We were able to resolve both of the disputes amicably, and Companion Maids was able to learn from those experiences. In the future, we will be putting an emphasis on a strict hiring process, and being as thorough as we can in vetting our future employees before they clean a home on our behalf. Our amazing cleaners are the function of our company, so we need that function to be strong. We will always listen to our customers, the lifeblood of our business, about what we can do to improve, and act on it as soon as we are able. There will always be things we will pride ourselves on doing well, but there are always things we can do to improve. This commitment to excellence is what I personally believe led to our receipt of this prestigious award. This year, our goal will be to continue to strive for excellence, grow with Angie’s List, and do what we can do retain this award for the work we do in 2016. Could a three peat be on the horizon? That will be up to our amazing cleaners, and our loyal clients. So to Angie’s List, thank you! We appreciate the award! With that said, since it’s the beginning of a new year, we will be writing a recap post soon! Stay tuned for that!